You love books just like Kaylee. 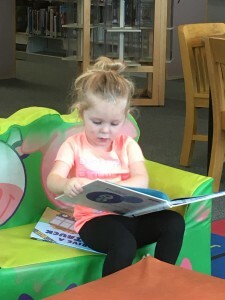 One of your favorite things to do with Nana on Wednesday’s is go to the library for Story Time. You get to listen to stories and sing and play. Grandpa likes books, too. I read books all the time and I love to read books with you. We usually get through most of the books if they are short, but not usually all the way through if they are longer because you are a squirmer. Something else is going on around us that you just have to check out. That’s alright, too. We will try an experiment. I am going to pick out some books that we can act out together. Let’s see how that goes.